My Gram and Jada took their first steps hand in hand on April 10, 2009. Jada was eleven days away from her first birthday the day my Gram died. She had been trying to take her first steps for a few weeks. She would get up and get ready and then she would sit down, as though she were afraid. 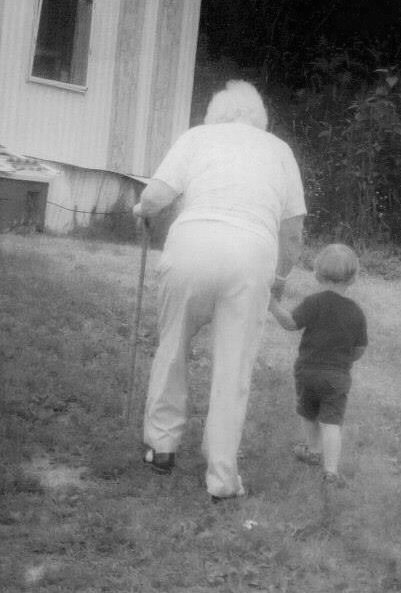 The afternoon my Gram died, Jada took her first steps with her hand at her side, as though someone was holding her hand. I am sure it was my Gram helping her take her first steps as she took her first steps on the other side. It was the first steps for us as a family without her, and for her without her body. It was a different world for all of us. We were all learning to live this new life. Through the pain I could see the gift my Gram gave us; a story to reminisce about on the day that tore our world apart. That was who my Gram was, she was always helping others, even if it meant she went without. Watching Jada take those steps I knew she would stick around and protect us. I knew our worlds were still connected. I knew she was not gone. Those thoughts gave me peace, but it did not take the pain. My first steps without my Gram were agonizing. I remember seeing the world as though it were going by in slow motion. Looking at people walking past me and thinking they had no idea how broken my world was now. They had no idea the pain inside of me. They had no idea that I had just lost all that I knew. I felt disconnected from the rest of the world. People do not understand the pain of losing someone so important unless they have lost someone. The experience has no words to truly explain the feelings, the raw emotions that are rushing throughout your whole body. There is nothing that compares. People want to help, they want to have the right thing to say to give comfort. There are no words. Nothing brought me comfort. Time. Time is all that helped with my healing. Hearing people say “time heals all wounds,” is not helpful. Hearing it only made me angry; my loss will never be “healed” as in “fixed,” but with time I learned how to rebuild my life without her physically in it. I explain the loss as losing a leg and then learning how to walk again. With determination and help you will walk again; if you want to. You have to deal with the pain and the road to recovery is different for everyone. You can give up, get an infection in the wound and let it kill you. Or you can take the care that you need to, no matter how long it takes and recover. It is never over; your leg never grows back. That is the new you. It is all in what you make of it. Your first steps will not be easy, they will not be without pain. You will think back to when you had your leg and you may get angry. You may get so angry that you start to give up. You may think that it is unfair, that this is not how it was supposed to be. You may have dreams where you have both legs and you are running. Feeling free, like your old self again. Then you wake up and you look down and you are reminded that life will never be the same again. The dream brings more pain than joy as you feel the loss all over again. In time you are able to smile at the gift of the memory. Every day is a new day to feel new things. To cry new tears. To smile new smiles. To be thankful for the memories that fill the spaces. It will not be easy, it will be some of the hardest days of your life. Time moves on, even if we do not. The first steps are the hardest, but take heart knowing that as you walk those first steps into your new life, you are not alone. If you believe you will feel their presence. The good news is you only have to take those first steps once. It is all in the way you look at things. The seventh anniversary is fast approaching as I find myself full of love and peace for the first time since her death. I am sad, and cry occasionally as memories flood my thoughts. Sad. Not overwhelmed with depression. In past years as soon as I remember that Easter is on the way I would become depressed and it would last for a few weeks after the true anniversary (April 10th) of her death. Depression that took the life out of me. Depression that made it hard to breath, hard to sleep, hard to do anything except feel sorry for myself and be angry at the situation. I often thought how unfair it was that my best friend was sixty-two years older than me. How unfair that the only person to love me completely was taken from me. I was so angry as I thought about the timing of our lives. I would cry thinking how different it could have been had I been born earlier, if I had been able to have been with her longer. I thought about how alone I was in this world since losing her. I thought how I did not deserve love from anyone else and I did not want to find love because I never wanted to feel this kind of pain again. I disconnected myself from everyone, even my children. I did not want to ever feel like this again. The journey through my grief has been a long, painful, devastating one. The road has been bumpy; but one thing never changed. One thing always remained the same; my Gram has never left my side. As in life, when ever I need her, she is there. She raised me with enough strength to get through the toughest obstacles. She loved me unconditionally, and this journey has taught me that love never dies. The love she gave me could not be taken from me. She loved me so deeply, so purely that it has become a part of who I am. That is a gift that can never be taken from me. After seven years, enough of the pain has brushed away for me to be able to recognize this gift. It was always there, and it was what kept me alive when all I wanted to do was die to be with her. It kept me moving forward when I did not know where my next step would take me. It was always inside of my heart, right where she planted it. A lot has happened in the last seven years. There has been so much pain, so many accomplishments, so much laughter and so many tears. And up until recently, I looked at it with negative eyes and thought she has missed so much of my life and so much of my children’s lives. I see now that she has not missed a thing. She has been right there beside us the whole time. Wiping away tears, hugging our hurt hearts, and high fiving our accomplishments. That Jade ring she gave me the night before she died has been on my finger everyday, except while being repaired. When I look down at my hand I sometimes see hers and I am reminded we are never alone. The kids and I have dreams where she visits. Alana and Jada swear they hear her tell them goodnight. We all miss her everyday. We all feel her presence. We celebrate her birthday and we talk about her to keep her memory alive. If you know me, you know my Gram. I talk about her often, and most conversations circle back around to her. She was and still is such an important part of my life. Her memory will continue on as long as those who know her are still alive. The past few months have been some of the hardest, however they have shown me a lot about myself and the people in my life. Overcoming pain, reliving events that happened so many years ago and having a chance to do things differently. Depression came in and out. And for the first time ever I allowed myself to heal so much pain and look at things differently. For the first time ever I allowed myself to matter. I have worked hard the last few months to learn who I am and why I think and do things the way I do. I have given myself permission to learn to like myself. Loving is coming, but it is a long, long road. I have also learned to be able to receive love from others. I am working hard at believing that I am worth their love. I deserve love. I deserve to have that kind of love again. I know now that I do not have to face the world alone. I know that I am capable of loving and being loved. I also know that love is worth the pain. I now can look at the love I received and gave my Gram as a gift. My anger and deep, overpowering sadness has turned into gratitude for what I was given. Some people spend their whole life looking for the kind of love she gave me. And although I only had her in my life for twenty-seven years; I had her in my life for twenty-seven years. It is all in how you look at it. I could have lost her eighteen years before, but I didn’t. I was given the gift of her love and guidance for as long as she felt that I needed her. She had enough time to instill in me all the values she felt were important. She taught me that I have all that I need inside of me, and most importantly she taught me to never give up. I come into this seventh year grateful for everything that I was given. I am thankful that I will never be alone because I will always hold the love and memory of my Gram in my heart. I am thankful that I can see the beauty in the pain. I am thankful that I found someone who loves me as purely as my Gram did, and who did not give up on me when I tried to show him all the reasons that he should. I am grateful that I was given the chance to live the rest of my life loving someone who loves me as much as I love them. I am thankful that I understand that the love is worth the pain, for that pain is a pain like no other. That pain has the power to take everything away from you, but it also have the ability to give you all that you need. It is all in how you look at it. Embrace the pain and take what you need from it, just don’t let it take anything more from you. Six years ago I wrote this about how I was feeling after the loss of my gram a year after the loss. You would think that after taking a full 3-credit college course and getting an ‘A’ would make me a little more in tune to my own grieving process. The fives steps they tell you that are all apart of what grief is, right? It should be easy for someone that has been educated in this subject to at least notice the stages within oneself. Denial and Isolation, Anger, Bargaining, Depression, and Acceptance. Looking back at the past 15 months I can see times where I have dabbled within each of these steps. I can also see where I have gotten so close to Acceptance and ran just as fast away from it. Thinking that if Acceptance is had than there is no where else to go. It is almost as though without my Gram in my everyday life that I am not living, nor do I really want to at times. I will live but I will not be alive. People say stay strong for your kids, and I am trying, but it really isn’t that easy. I’ve had to be the strong one my whole life and my rock, the only person that I had to help me stay strong has gone. Without her I can feel myself start to crack, crumble into dust that is the sand that the world has been walking on. I have never ever in my life admitted that I am weak or that I may possibly need help, but I have hit the bottom and if I go any further down I know that getting back up will be a massive struggle. There is a period in my life, that looking back on, all I can see is blackness. I didn’t know then that I was depressed. All I knew is what was. I think back to that time and I do not want to go back. I know that my Gram would want me to grieve and get over it. I have great comfort in knowing that I will see her again, even greater comfort in knowing she is still here with me. Since she died I have not felt like she was completely gone, and I think that may be the only thing that has keep my head above water. The day before she died she gave me her Jade ring, her good luck charm and no matter how hard I tried to give it back to her she would not take it. That night I looked at in on my finger and knew what her plan was. It was a plan that I had feared my whole life. I can remember lying in bed at her house crying myself to sleep hoping that she would be alive in the morning. Her death had always been my biggest fear. I did not think that I could ever live without her. She was my soul mate; we had an instant connection from the time that I can remember. She was where I always wanted to be, she was my best friend, my everything. She has been taken from me and I am left here wondering what the hell do I do now? Everyday is a struggle and a journey until the next day. My gram was an amazing woman who lived her life to the fullest. She was given 2 weeks to live after a massive stroke 18 years before she died. I was the only one there when she was having her stroke, and she kept it together long enough for me to go get help. We had always been there for each other when we needed it the most. That is what makes this so hard. The hardest thing I have ever had to deal with and the person I counted on is not there to help me through it. I was recently told that I am depressed. I knew this and I didn’t. I knew that important things were no longer important and I knew that my whole body ached. I have all the classic symptoms, the ones that I learned about in high school and college, but I didn’t want to acknowledge them. I guess I thought that if I made them into no big deal they would go away. The commercial about depression that says “depression hurts,” it really doesn’t make any sense until you are depressed. It does hurt, a lot and all over. As I step back a little from my world of sorrow I see the way my Gram lived; just that; she lived. She lived every day to the fullest and when they told her she was going to die she basically laughed at them and went on her own terms. A few weeks before she died, after her son, my uncle passed away she told me she was ready to go. She said that she knew that I no longer needed her. She said her job here was done and she was not afraid to die. I tried to tell her that I was not okay and that I couldn’t imagine life without her, but she would not hear it. We tried to plan a funeral for her, but I kept putting it off. I really couldn’t bear the thought. I had also had plans on writing her Memoir to get some of her amazing stories on paper, but I put that off too. I had it in my mind that if that was written she could go. I had all kinds of these thoughts on how to make her live forever, obviously they didn’t work. At the hospital, the morning she died I went into her room and saw her lying there, so helpless yet peaceful. I had always thought that seeing a dead body, especially hers would be impossible. It was not, I did not want to leave her there. I kissed her and held her and smelled her. I leaned over her and watched my tears hit her forehead, and I was hoping for a miracle, like in the movies. I know it sounds stupid, but I really was hoping that my tears would bring her back to life. She was laying in one of the new hospital beds that adjust to body weight, and for a spilt second I thought she was breathing. It was amazing. For that second I thought she was back. But she wasn’t. I held her hands and caressed her arms, kissing her forehead. I did not want to leave because I knew it was going to be the last time I would ever see her body again. The one the comforted me for so much of my life. I felt horrible leaving her there, I wanted more than anything to be able to push her out of her room in her wheel chair and have her home again. Instead, I walked out carrying the bag of her belongings. That was an awful, empty feeling. The next few days are a blur. I wanted more than anything to communicate with her. I just wanted to talk to her. I would say one last time, but once will never be enough. For my birthday that year I was able to have a séance with three other people. She was not strong enough to really communicate much, but she was able to tell me that she was okay and that she hated leaving me. She was also able to help take some of the guilt I had been feeling away. I wanted so much to dream of her, to communicate that way, but each morning I would wake up with nothing. Until recently. I have been having dreams occasionally; they are so nice it is hard to wake up. I know that she is really there with me and that is how I find life bearable. But to get to the much needed point, I am ready to start living life again. She was/is the person I most want to be like and letting depression swallow me whole is not going to get me to that destination. Even from death she is helping me through this tough time. I think all I needed to remember is that even though she is not here physically, she will always be here helping me along the rest of my journey. I was blessed to have her in my life for as long as I did. I am really looking forward to grab a hold of Acceptance and embrace it; it is what she would have wanted.